Hughes is the second top-flight boss to lose his job this season. Southampton have parted company with Mark Hughes but this season is still on course to be a quiet one for managerial changes in the Premier League. Hughes becomes the second top-flight boss to lose his job this season, following Fulham's sacking of Slavisa Jokanovic last month. That represents a quiet start compared to recent years and stands in marked contrast to last season, when six managers had left their roles – matching a 10-year high in the competition. Two more in January matched 2007/08's record by that stage of the season and a late-season flurry led to a record season total of 15 changes. 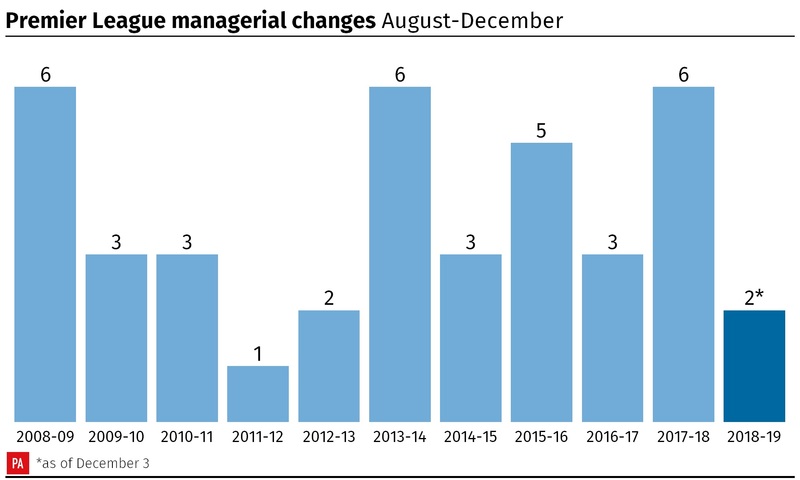 December has often been a busy month for changes, with multiple changes in seven of the 10 seasons before this and a peak of four in 2013/14 when Fulham, West Brom, Tottenham and Cardiff all pulled the trigger. That took that season's tally to six by the new year – the same as 2008/09 and matched again last year. But with most managers seemingly secure in their roles for the time being this season looks set to remain a reassuringly quiet one for the men in the hot-seat. Manchester United's indifferent form has brought scrutiny on Jose Mourinho's position at various times but the club have stood firm up to now. Newcastle's recent three-match winning run shifted the focus away from Rafael Benitez, although Saturday's dismal defeat to West Ham left them just one win above the relegation zone while the Spaniard's fractious relationship with club owner Mike Ashley will put pressure on their January recruitment. Fulham and Saints occupy two of the relegation places – sandwiching Burnley, whose seventh-placed finish last season earned Sean Dyche Europa League qualification, credit in the bank and a pub named in his honour. Huddersfield and Cardiff are just above the drop zone, with their respective managers David Wagner and Neil Warnock having led them to promotion and arguably over-achieved with the squads at their disposal. Crystal Palace are the other team within three points of the bottom three but there has been little discussion of Roy Hodgson's position, while Manuel Pellegrini has overcome a slow start to lift West Ham to 13th. The 2016/17 campaign had seen just one change by this date – Francesco Guidolin sacked by Swansea – but his successor Bob Bradley lasted only until late December by which point Palace had also axed Alan Pardew. The 2014/15 season was similar while 2015/16 saw three changes in October alone, with two more in December.